UKIP leader Nigel Farage has vowed to the British public that should he not win the Thanet parliamentary seat he will eat a paella. Launching the party’s manifesto, Mr Farage said “It’ll be a huge paella and not one of those microwave ones from Asda neither. This will be a proper Spanish one with snails in it and everything. And I’ll devour every last filthy European bite of it off a plate made in Sweden whilst using foreign cutlery. And furthermore, whilst my wife is doing the washing up I’ll dance La Cucaracha. And most likely so will you, because that’s what’ll happen to all of us unless you vote me in to keep Britain Britishy.” he warned. 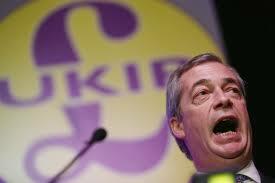 “Thanet is a microcosm for the independence referendum as a whole. If people vote me in it means they want out of Europe. If they don’t it means they’ve gone all cosmopolitan and I too will get right into this Euro business by eating a paella. After that I might well do a bit of a clog dance, have a game of boules and then flounce up and down Margate pier wearing a pair of lederhosen.” He continued. One Margate resident told us that if Farage failed to win at Thanet it could be the end of UKIP leaving no option but to give in and embrace other cultures. “If Nigel goes all Euro on us then we’ll all have to I suppose. I blame Chas’n’Dave of course. If their ‘Down to Margate’ song hadn’t proved to be a world wide hit none of these foreigners would have ever found us.” He explained. Well, Farage knew things really started to go downhill when the song “Live is Life” by the Austrian band Opus went to #1 throughout most of Europe and squeaked to #6 in the UK back in 1985. The hull was breached by the Continent. He saw the writing on the wall and knew it was a matter of time. The man could only fight for so long.